Here at RealtimeBoard, we set out on a mission to build a universal whiteboarding tool that helps companies embrace digital transformation, manage remote teams and think visually in order to speed up internal processes and delight their customers. Today, we asked Andrew Wight, Associate Creative Director at SapientNitro, to share his insights on how to create a digital transformation culture in your organization. Organizations are realizing that they need to innovate, not just to grow, but to survive. At SapientNitro, we’re seeing our clients placing bigger bets on transformation programs in order to create sustainable competitive advantage. This requires a focus on delivering new value and experience, so rather than have technology drive this agenda, we take an experience-led approach. However, designing and visualizing how an organization delivers its value proposition across time and touchpoints is incredibly complex. It requires buy-in from senior leadership, collaboration between a diverse set of stakeholders, and the ability to create and articulate a vision at multiple levels of scale. We’ve found that as the ambition, budgets, and number of stakeholders in these types of engagements increase, the old tools and methods for service design just can’t keep up. We’ll walk-through some elements that need to be able to evolve constantly with the business, the market and the focus of the transformation program itself. 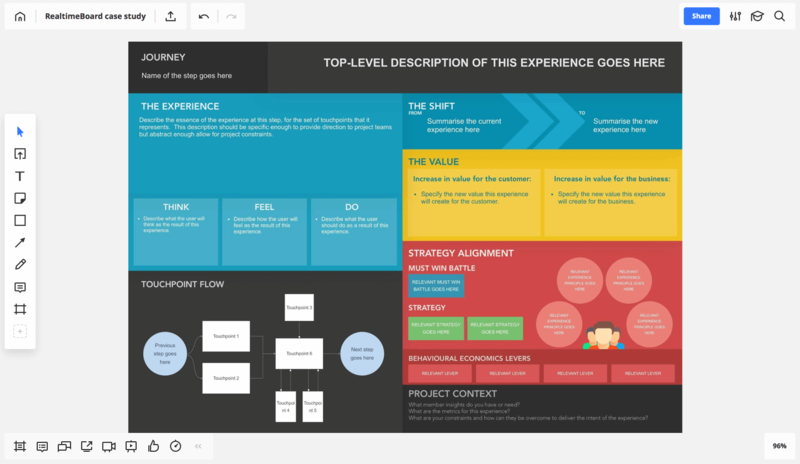 We use RealtimeBoard to manage these in a way that is fluid and collaborative and would love to share how we leverage it as our core tool to initially develop the transformation vision and ideas, and then ultimately to generate the final deliverables. SapientNitro is an interactive marketing, design and technology services agency offering ‘storyscaping’ solutions – a new approach to advertising and marketing that involves using stories to design emotional and transactional experiences both online and offline. Clients: Chrysler, Citi, The Coca-Cola Company, Lufthansa, Target, and Vodafone. Lay out the customer lifecycle along the top, left-to-right. This is rarely a strict sequence, but there’s usually a loose chronology that the phases and steps fall into. List out the channels along the side, top-to-bottom. Identify every channel through which a customer can (or should be able to) interact with your brand. Face-to-face, phone, web, mobile app, social, radio commercial and so on. Identify the touchpoints. Wherever a journey step and a channel intersect, you have a touchpoint. Every experience a customer has with your brand happens through a touchpoint. We find it useful to break the phases up into blocks and tackle each one individually. Looking for an Agile management tool to simplify remote collaboration? The images above represent the frontstage section of the blueprint. For the backstage processes, simply add a row for each of the internal stakeholders that need to perform actions in order to deliver the experience defined for each step along the top. For the purposes of this case study we’ll focus on the frontstage section of the blueprint, which articulates the end-customer experience. You can do this exercise for your current or future state experience, but in the context of a transformation project you’ll want most of the effort and emphasis to be on where you’re going rather than where you are now. Working out what to put on the blueprint requires expertise and buy-in from right across the business. We assemble a cross-functional team with representatives from marketing, UX, customer service, product, IT, legal and compliance and any other areas represented within the organization. This team is a microcosm of the entire business and allows us to bring diverse perspectives to bear on the biggest challenges and opportunities it faces. Another step towards digital transformation of the organization is the phase-by-phase workshop of the blueprint, through identifying the key strategies and innovations required to move the needle and push the organization forward. At SapientNitro, we find the best way to facilitate the creation of the blueprint is for the cross-functional team to workshop each phase. We start by placing the steps for the phase up on a wall, with each name and description printed out on an A3 sheet of paper. The team debates these, moves them around, tweaks the descriptions and adds or removes the steps. — Describe, in the first person, the magical new experience of this touchpoint? — Describe the key moments before and after, which make this moment possible/successful? — What new value does this experience create for the customer and for the organization? Each team then presents their touchpoints back to the group who comments on, questions and debates each idea until they represent the shared perspective of the team. The lead designers then take these handwritten touchpoints away and apply them to the blueprint on the RealtimeBoard, adding in additional touchpoints for completeness. The phase is provided back to the team who use the RealtimeBoard comments tool to provide discussion around final tweaks. This process is repeated for each phase in the customer journey. The service blueprint is a broad, macro-level view of how the organization delivers its service proposition. It shows how the touchpoints can work together to create valuable, coherent experiences but it is missing the detailed decisions required across the many initiatives that make up a transformation program of work. At this micro-level view we use a micro-journey brief. Micro-journeys are the discrete moments that chain together to make up the broader customer lifecycle. Each column in the blueprint represents a micro-journey which needs to be considered and connected to serve a bigger transformation agenda. Because the scale of a transformation program is too big to attempt to design everything in one go, we aim to have just enough detail to describe the coherent, game-changing experience that the program needs to deliver, without prematurely trying to make detailed design decisions. We achieve this by creating a set of briefs that project teams can use to direct decisions. The role of the micro-journey briefs is pretty similar to Peter Drucker’s definition of strategy: “a sense of direction around which to improvise.” Each micro-journey describes the essence of the experience within a step of the broader journey, what shift it represents, how the touchpoints combine to deliver this experience and what new value this will create for both the customer and the organization. The micro-journey briefs should be written at the level of a design pattern: a description of the core solution to a problem, in such a way that you can use this solution a million times over, without ever doing it the same way twice. It needs to be specific enough to provide concrete direction to project teams but abstract enough to allow them to work within the constraints of their specific project. 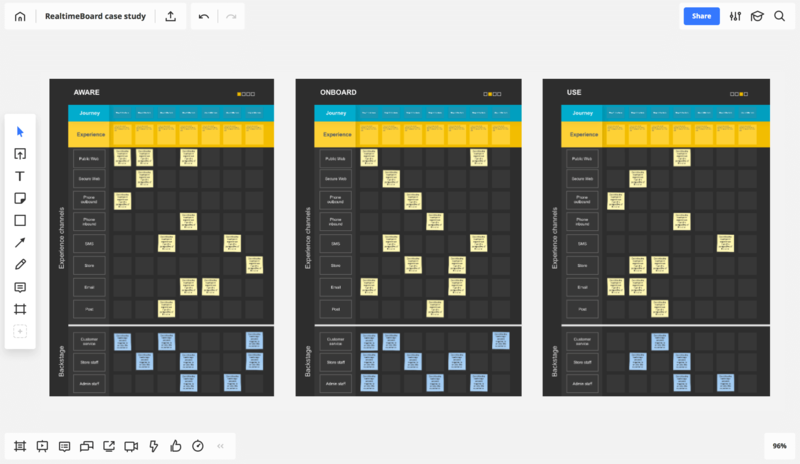 The lead designers assemble the micro-journey brief for every column in the blueprint on the RealtimeBoard, which are then put back to the cross-functional team for comments and discussion. It doesn’t need to look like a finished product, but it needs to look good enough to convince everyone else of the potential. A great designer is required to make your ideas look good, fast. The artifact that really brings these ideas to life is the vision storyboard. This is a story about a customer that shows what their lives will look like in our future state; how they interact with the brand, how it makes them feel, and the value that creates in their lives. We use a professional storyboard artist to draw this up and it becomes the clearest, most human expression of the vision for the organization to rally around. This can be done before or after the blueprint workshop but we prefer to do it before as it provides something tangible that senior stakeholders can buy into before the cross-functional team starts thinking about detailed touchpoints. 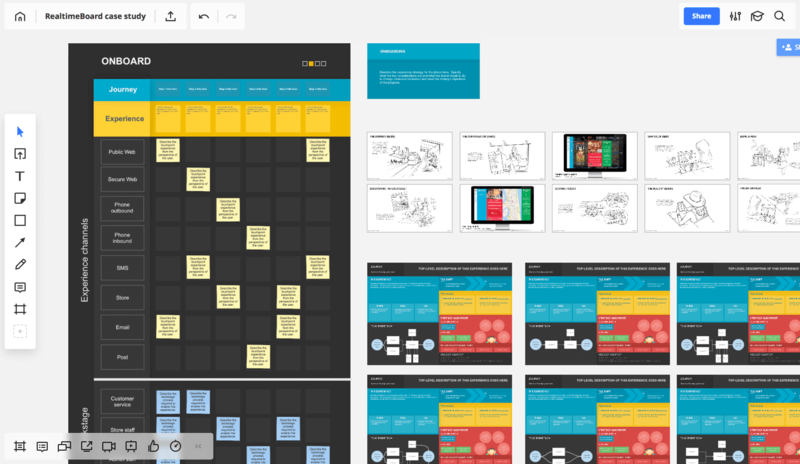 Although RealtimeBoard is suitable for real-time work-in-progress collaboration, we use it to actually represent and produce the final deliverables. We create branded backgrounds in Photoshop that have design details like drop shadows and specific typography, which we drop onto RealtimeBoard and layer live text over. This allows our working files to turn into the final deliverables with no waste. We create a frame for each element and order it according to how we want the final deliverable to appear. Whenever we need to produce a document we simply press ’Save as PDF’ and a deliverable-grade document is generated. 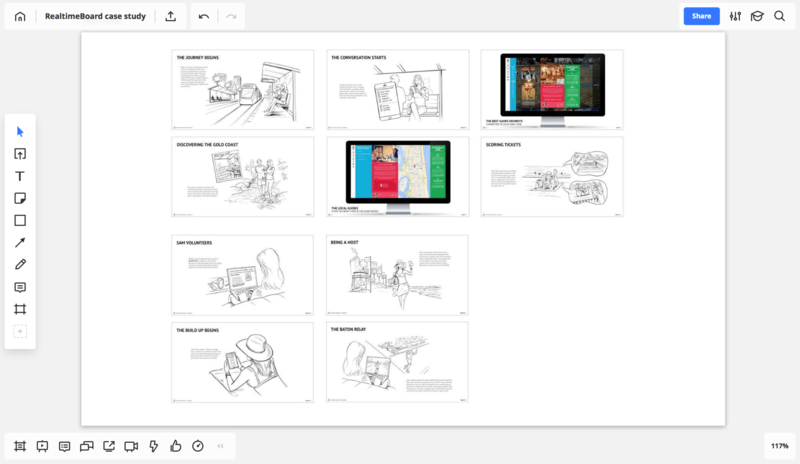 Our most recent project has 93 elements, which translate into a 93 page PDF document for anyone who isn’t a collaborator on the RealtimeBoard to use. 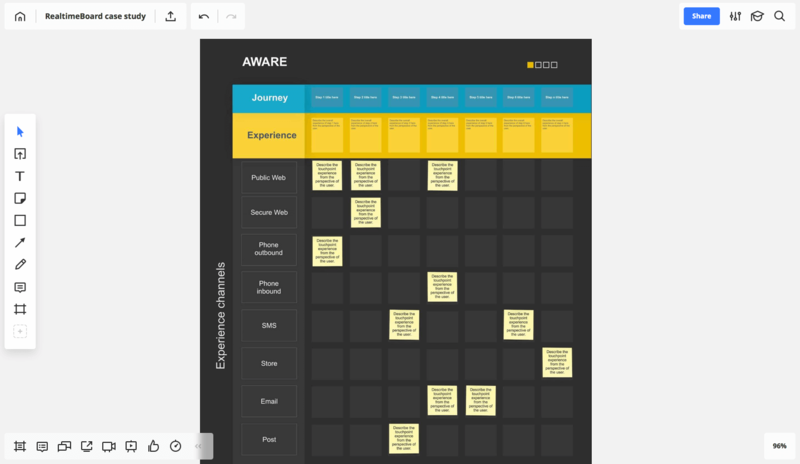 We chunk the elements into journey phases, with each phase containing a section of the blueprint, the experience strategy, storyboard and micro-journey briefs. Depending on the complexity of your service proposition and how granularly you choose to represent it, you’ll likely end up with somewhere between three and 10 phases. 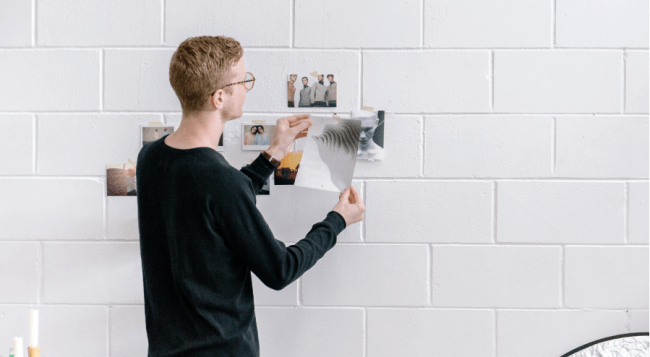 The service blueprint, strategy, storyboard and micro-journey briefs are living documents which need to be able to evolve constantly with the business, the market and the focus of the transformation program itself. 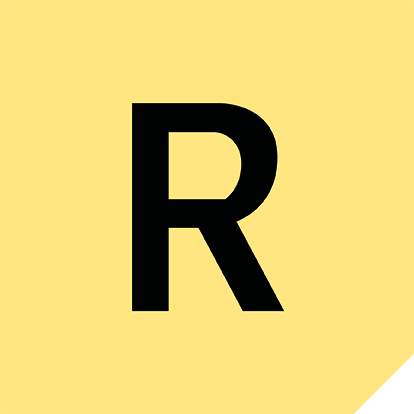 Because the source of truth is the RealtimeBoard, any of the collaborators can work together to update the elements as required and the latest documents can be produced at any time with a single click. Whenever a project is initiated in the program, the Customer Experience team works with the relevant project team to determine which touchpoints it touches and provides the appropriate strategic context and micro-journey brief(s). Designers on the project team can then follow the brief – according to the constraints of their specific project – to ensure that what the project delivers will amount to a coherent experience when it’s connected to the other touchpoints delivered across the program of work by other teams before and after it. produce high-quality final deliverables that create buy-in from senior executives and inspire and direct hundreds of stakeholders across the business. If you find this article useful, feel free to share it via the Social buttons, or ask any questions below. We wish you best of luck in your transformation efforts, and we hope this guide helps you to make more of a positive impact on the organizations you work with and the world in general! 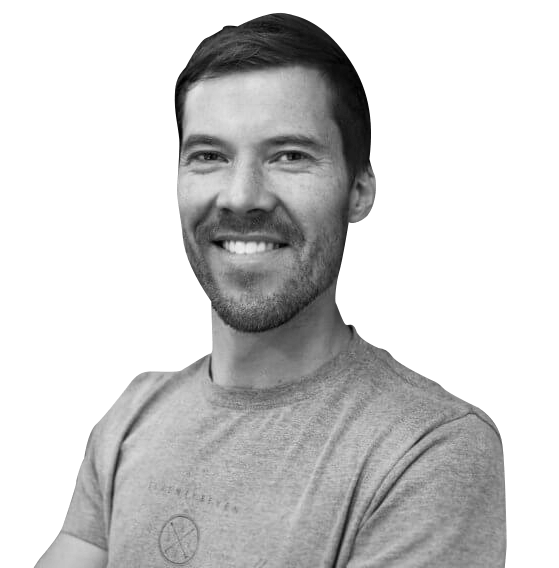 Andrew Wight is an Associate Creative Director at SapientNitro and a co-founcder and CEO at adieu.ai, a startup which is using artificial intelligence to help humans resolve conflict. For more updates, you can follow him on LinkedIn.